In its twenty-second installment of the emerging Latinx artist exhibition, YLA 2017 arrives at a time of a complex social-political milieu. In the U.S., this includes an administration with a vehement focus on the Mexican border, widespread economic inequalities, increased racial tensions, and subsequent hate crimes on the rise. Within this context, the eight featured artists delve into idiosyncratic negotiations with self, family, and society. Nansi Guevara, Daniela Cavazos Madrigal, Mark Anthony Martinez, Michael Martinez, Paloma Mayorga, Andrei Rentería, Ashley Mireles and José Villalobos navigate matters of gender restrictions, immigration politics, cultural heritage, and privilege, confronting viewers with prominent issues of the contemporary zeitgeist. Flores, Nancy. “Latino millennial artists showcase intersection of art and politics” The American-Statesman, June 29, 2017. Courtney, James. “A Steadfast San Antonio Presence in Austin’s Annual Young Latin@ Artists Exhibition” San Antonio Current, July 11, 2017. Sarkar, Christian. YLA 22: ¡Ahora! – Activist Art in Austin, Texas Huffington Post. July 13, 2017. Rees, Christina and Rainey Knudson. “Top 5” Glasstire, July 13, 2017. Cruz, Araceli. “8 Texan Artists Take on Identity and Politics in New Exhibit” Mitú, July 18, 2017. Aquino, Marco. “Mexic-Arte Museum Highlights SA LGBT Artists” Out in SA, July 27, 2017. Charur, Malena. “Laredo artists featured in ‘Young Latino Artist’ exhibit at Austin museum” Laredo Morning Times, August 7, 2017. Charur, Malena. 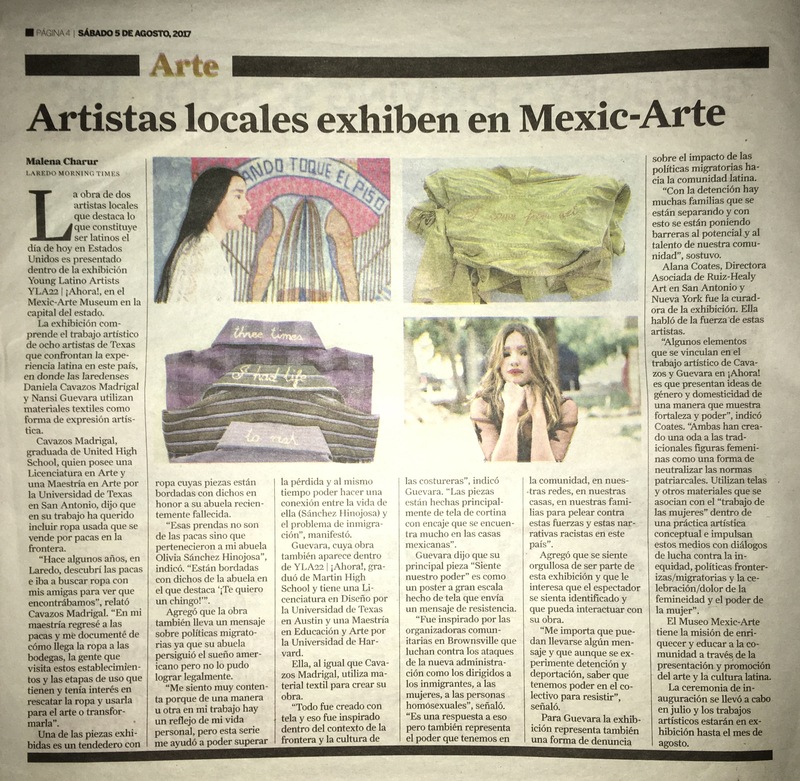 “Artistas locales exhiben en Mexic-Arte” Laredo Morning Times, August 5, 2017. Aquino, Marco. “Artist Jose Villalobos Deconstructs Symbols of Masculinity” Out In SA, August 18, 2017. Dennis, Carly. “Young Artists Reflect on Latinx Experiences in Texas in ‘¡ Ahora !,’” Latinx Spaces, August 5, 2017. Anderson-Ramos, Sam, “Young Latino Artists 22: ¡ Ahora ! at Mexic-Arte Museum” The Austin Chronicle, August 18, 2017.